Quay Club - Ready Steady Gone! Newcastle’s Quay area has some of the finest waterside views in the north east of England, attracting tourists and photographers from all over the world. There are six splendidly engineered transport bridges over the Tyne linking Gateshead with Newcastle, all within three quarters of a mile of each other. Then there is the equally impressive Millennium pedestrian bridge. Situated on the Gateshead side of the river are the Sage music venue and the Baltic Centre for Contemporary Arts, a stark contrast of old and new architectural styles. All of these structures double their impact on the observer by reflecting their striking images in the river Tyne, in particular when viewed from the north bank. Add lots of trendy bars, restaurants and water side apartments and you have today’s Quayside. Night or day it’s hard not to be impressed by the area. Forty years earlier in the sixties, the area was much different, with run down or derelict buildings, bomb sites and ill lit thoroughfares. The most respectable places back then were the couple of restaurants housed in the Tudor buildings (still standing) on Sandhill just around the corner from the Quayside. Within a minute’s walking distance of these timber framed buildings was a very popular club, aptly named the Quay Club. The club opened on the 17th December 1965 and was owned by two businessmen named George Hoffman and Bob Lewis. The club was managed by Bill Keith who was also the manager of the Newcastle band, the Chosen Few. The Quay Club was located near the swing bridge over the Tyne on a thoroughfare called ‘Side’ and was situated roughly opposite the Crown Posada pub. The building that housed the club has since been demolished and has been replaced by a new block containing offices and a pizza restaurant. The Quay Club was much smaller than the Club a’Gogo. It had two main rooms; a lounge bar on ground level and a basement below where the bands played. The lounge was long and fairly narrow with a bar at one end near the entrance and a stair well at the other leading down to the basement. The stairs were quite steep and narrow and were very difficult to negotiate carrying amplifiers and drum kits. The basement was very dark and small – probably no more than about 15 metres in length and about 4 metres wide with a low ceiling. There was no stage and the bands would normally play at the end of the room furthest away from the stair well. The Quay club booked mainly local bands but some top names performed there over the years, including the Family and Ten Years After (with Alvin Lee). The Quay Club became a recognised meeting place for local musicians. Before a visit to either Bowers restaurant (opposite the Central Station) or Barbecue Express (at the top of Pink Lane), a lot of local band members used to meet up at the Quay Club after their own gigs in the Newcastle area had finished. Amongst others, The Chosen Few, Alan Hull (Lindisfarne), The Gas Board (with Bryan Ferry) and drummer Alan White (from The Blue Caps and subsequently Yes) could regularly be seen at the club. And it wasn’t just local musicians who used the Quay Club as a watering hole after a night’s work. Other artists who were appearing elsewhere in Newcastle or just visiting the city frequently used to call in at the club. These included Eric Burdon, Pink Floyd and Geno Washington. In spite of a good first few months, there were some problems with the club and it closed to the public at the end of May 1966. It reopened again on 4th August 1966. 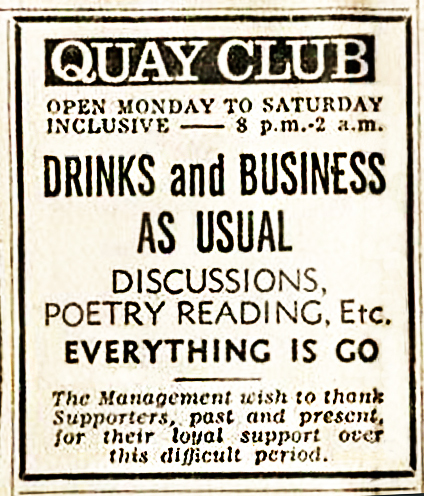 A year later, hoping to attract a wider audience, the Quay Club started to promote jazz nights once or twice a week. The club continued trading for another few years experimenting with various genres such folk music, poetry and comedy and eventually closed in 1969. The best years of the Quay club were between 1965 and 1967. “Tom Jones was in town at La Dolce Vita and was brought to The Quay Club when we (the Elcort) were playing, I think by Mike Jeffery from the Club A’Gogo. He stayed for a few numbers and then shook hands to leave. After a short while the barman came down and said that Tom was having a drink upstairs and had sent down a couple of drinks each for the lads. I went upstairs to thank him, and saw that he was at the door ready to leave. I walked over to say thanks and, as I did, a bottle flew through the door nearly hitting him. It had been thrown by Eric Burdon or one of his cronies in an open top car motoring down the street shouting “F*** off back to Wales”. Overall I remember the Quay Club as having a more intimate and certainly a less intimidating atmosphere than the Gogo and in spite of the odd fracas such as that mentioned in Glyn’s story the club was mostly trouble free. After four years as one of Newcastle’s top clubs for young people the Quay Club suddenly came to an end. 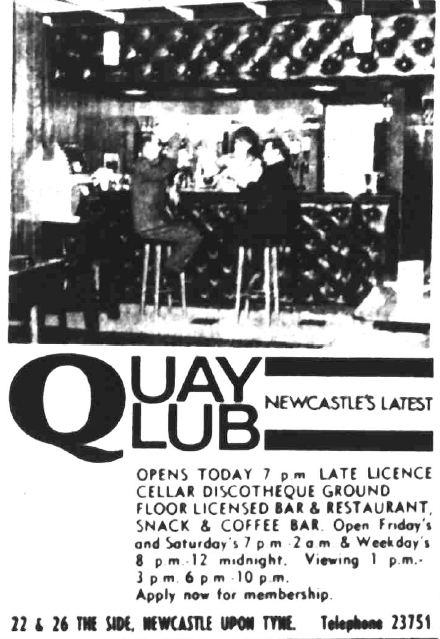 On 12th September 1969 an advert appeared in the Newcastle Evening Chronicle stating that due to unforeseen circumstances the Quay Club would be closed until further notice. The ‘unforeseen circumstances’ are believed to be a fire at the premises. As far as I am aware the club did not reopen. I only went to the Quay Club a couple of times and remember it as small, dark and dirty. Downstairs, if you had the nerve to descend them, was full of what appeared to be copulating couples. Or was that just wishful thinking? In the sixties, I was a croupier with the Bailey Group and after work and before we'd head off to Bowers for breakfast we would visit a club or 2. I remember Bill Keith very well, went out with him for a short while too, but i think i heard he was still married, so not for me, still happy daye and happy memories. I'm 75 now not many of the old folks left. I remeber the Quay Club well. Between 1967 and 69 I used to go there on a Friday or Saturday night after the Printers Pie (my usual wateringhole closed at 11pm. You could drink till 2 am and get a fry up at Bowers opposite the central station then catch the all night bus home to Benwell. You loved the place. I recall one night seeing Robert Plant in the Band of Joy Playing there. Kevin Gammon was the guitarIst in the band iI think. Anyway great times. Wouldnt swap them for any. In 1963-4 I used to go with my girlfriend at the time, Liz Lord, to a place on The Side called The Cafe Montmartre.It had a jazz club in the basement and we loved it for its Bohemian atmosphere. It was our favourite haunt but we didn't let our friends know about this jewel of a place. Many years later, I met Liz at a party and she said that she'd told people about our days in The Montmartre and no one knew of it. The reason was that it had become the Quay Club. Until I read this article I'd often wondered what happened to the place and now I know. This is a wonderful article. Thanks for all the work you've done in putting it together.